On the 11th (Sun), enjoy breathtaking views from Empire State Building. Get ready for a full day of sightseeing on the 12th (Mon): shop like a local with Fifth Avenue and then admire the masterpieces at The Metropolitan Museum of Art. For other places to visit, reviews, more things to do, and tourist information, you can read our New York City road trip planning app . Manchester, UK to New York City is an approximately 11-hour flight. You can also do a combination of flight and bus; or do a combination of flight and train. Traveling from Manchester to New York City, you'll gain 5 hours due to the time zone difference. Traveling from Manchester in November, things will get somewhat warmer in New York City: highs are around 16°C and lows about 7°C. Finish up your sightseeing early on the 13th (Tue) so you can travel to Key West. On the 14th (Wed), get engrossed in the history at Truman Little White House, then examine the collection at The Ernest Hemingway Home and Museum, then identify plant and animal life at Key West Butterfly & Nature Conservatory, and finally take in the architecture and atmosphere at Saint Mary Star of the Sea. To see traveler tips, photos, other places to visit, and more tourist information, go to the Key West trip tool . Getting from New York City to Key West by combination of bus and flight takes about 6.5 hours. Other options: fly; or drive. Plan for warmer temperatures traveling from New York City in November, with highs in Key West at 32°C and lows at 26°C. Wrap up your sightseeing on the 14th (Wed) early enough to travel to Grand Canyon National Park. 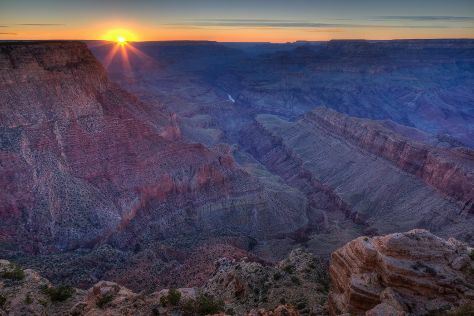 Spend the 16th (Fri) exploring nature at Grand Canyon National Park. Next up on the itinerary: hike along Rim Trail, don't miss a visit to Powell Point, admire the striking features of Grand Canyon Railway Depot, and get a taste of the local shopping with Lookout Studio. Plan my Grand Canyon National Park trip by asking Inpirock to come up with tips and suggestions. Traveling by combination of flight and bus from Key West to Grand Canyon National Park takes 13.5 hours. Alternatively, you can do a combination of shuttle, flight, and bus. The time zone difference when traveling from Key West to Grand Canyon National Park is minus 2 hours. In November, Grand Canyon National Park is cooler than Key West - with highs of 14°C and lows of -6°C. Wrap up your sightseeing on the 17th (Sat) early enough to travel to Las Vegas. On the 18th (Sun), shop like a local with The Strip and then examine the collection at The Mob Museum. On the next day, see the interesting displays at The Neon Museum, enjoy breathtaking views from Eiffel Tower Experience at Paris Las Vegas, then browse the different shops at Miracle Mile Shops at Planet Hollywood, then admire the local landmark of Bellagio Fountains, and finally have fun at Wee Kirk O' the Heather Wedding Chapel. To see other places to visit, more things to do, maps, and more tourist information, read Las Vegas travel itinerary planner. Traveling by combination of flight and car from Grand Canyon National Park to Las Vegas takes 4.5 hours. Alternatively, you can drive; or take a shuttle. Due to the time zone difference, you'll gain 1 hour traveling from Grand Canyon National Park to Las Vegas. When traveling from Grand Canyon National Park in November, plan for a bit warmer days in Las Vegas, with highs around 23°C, while nights are much warmer with lows around 9°C. Cap off your sightseeing on the 19th (Mon) early enough to travel to Healdsburg. Start off your visit on the 20th (Tue): do a tasting at Jordan Vineyard & Winery and then awaken your taste buds at some of the top wineries in the area. Keep things going the next day: do a tasting at Pride Mountain Vineyards, learn about winemaking at Anderson's Conn Valley Vineyards, then learn about winemaking at Robert Mondavi Winery, then do a tasting at V. Sattui Winery, and finally do a tasting at Beringer Vineyards. For maps, traveler tips, and more tourist information, you can read our Healdsburg road trip planning app . Do a combination of flight and taxi from Las Vegas to Healdsburg in 5.5 hours. Alternatively, you can drive. Traveling from Las Vegas in November, expect slightly colder with lows of 5°C in Healdsburg. Finish up your sightseeing early on the 21st (Wed) so you can go by car to San Francisco. Kick off your visit on the 22nd (Thu): take in the views from Golden Gate Bridge, then head off the coast to Alcatraz Island, and then take in the waterfront at Fisherman's Wharf. On your second day here, wander the streets of Marina District, then get a taste of the local shopping with Union Square, and then take a stroll through SoMa. Traveling by car from Healdsburg to San Francisco takes 1.5 hours. Alternatively, you can take a bus. Traveling from Healdsburg in November, you can expect nighttime temperatures to be a bit warmer in San Francisco, with lows of 12°C. Finish up your sightseeing early on the 23rd (Fri) so you can travel to Seattle. Kick off your visit on the 24th (Sat): see the interesting displays at The Museum of Flight, explore the world behind art at Chihuly Garden and Glass, then take in panoramic vistas at Space Needle, and finally shop like a local with Pike Place Market. For photos, traveler tips, maps, and other tourist information, read our Seattle trip itinerary maker website . You can do a combination of subway and flight from San Francisco to Seattle in 4 hours. Alternatively, you can fly; or drive. Traveling from San Francisco in November, expect Seattle to be a bit cooler, temps between 13°C and 6°C. Wrap up your sightseeing on the 24th (Sat) early enough to travel back home.